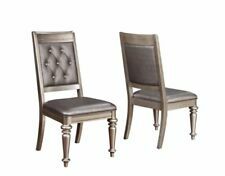 This dining side chair can be used as a dining chair or an accent chair. featuring webbed plush upholstery with rhinestone button tufting. These chairs are unique and gorgeous! Chair: 21.50" W x 24.50" D x 41.25" H.